The practice of using herbs to treat infertility can be dated as far back as 200 A.D. in China. Despite its long history of use in China and other parts of the world, the United States has been reluctant to endorse the use of herbs for infertility treatments. Since modern scientific theory cannot conclusively prove that herbs are an affective form of treatment, many American doctors choose to purposely overlook this type of therapy as a viable option for their patients. Even though the medical profession has been slow to back herbal remedies, an increasing public profile has helped make more people aware of the many benefits herbal treatments have to offer. It’s important to remember that herbs are not conventional medical drugs. People who are considering using herbs to help their fertility problems should keep in mind that this type of medicine looks to address both the mind and the body. It is about balancing out the body and treating the person as a whole, not just treating the symptoms. Herbal remedies for people experiencing fertility problems seem to work best in women with infrequent or irregular periods or for people with hormonal imbalances. A properly trained naturopathy or herbalist should be able to recommend a formula of herbs that will be beneficial to your individual situation. Because very little regulation exists in the world of herbal remedies, at least in the United States, it is important to be responsible when you are shopping for herbs. First, you want to make sure that the amount of herbs in each dose is clearly labeled. Buying herbal treatments that are already measured out into individual doses is a good idea to avoid mismeasuring a dosage. Although the FDA does not regulate the manufacturing of herbs, the U.S. Pharmacopeia does enforce some standards in the manufacturing process. Companies that produce herbs meeting their requirements have the "USP Dietary Supplement Verified" seal of approval on their label. Looking for herbs with this stamp can help reassure you that are buying a product with some quality. If the label also says that the herb has been scientifically tested, then consider contacting the company for the results of these tests. Never forget to use your common sense when comparing herbal brands and labels. If one herb says it can cure all your ailments from head to toe, it’s probably too good to be true. Although herbs can help many ailments, no one herb can treat everything. 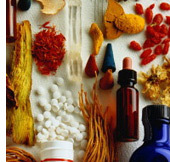 If you are seeing a naturopathy or herbalist, ask him if there is a brand that he can recommend. Herbs are potent. While they can help treat a variety of problems, they can also interfere with others. Many herbs have active ingredients in them that can cause adverse affects when mixed with prescription or over-the-counter drugs. It is therefore important that you are always honest with your doctor or pharmacist about any herbs that you are taking. If you are having surgery done, make sure you mention your herbal treatment, even if you are just thinking about taking them. Certain herbs can interfere with anesthesia or lead to complications.